It’s easy for tasks to become a burden for administrators—especially during busy days, weeks, quarters, and years. It’s not easy to take a step back and realize how much work we’re putting on ourselves. Doctor’s offices are no exception to this reality. Doctor’s offices are notoriously overbooked and this can put a significant amount of pressure on practice administrators who oversee all of the day-to-day tasks required to keep a medical practice running smoothly. In order to reduce administrative overload in a practice, we’re offering five ways to help practice administrators avoid and prevent it from happening in the first place. The first way to reduce administrative overload in a medical practice is by hiring a strong staff, meaning they’re experienced in the field, they’re able to multitask, they’re able to work under pressure and they’re able to work with each other. It’s not enough to simply hire anyone in the field. They should be a clear fit for your practice. It doesn’t matter how much of an expert they are; if they’re not capable of working with your team, they will ultimately disrupt the productive work environment essential for success. Aim to have at least three or four reliable employees who could potentially be the backbone of your practice. A strong foundation sets the tone for future employees. The last thing anyone should do, regardless of field, position, and experience, is to let their work build up. Procrastination is everyone’s enemy and it can easily put your practice in a dangerous position. Although, a long to-do list can feel intimidating, it’s important to prioritize your tasks and tackle them accordingly. Make an effort to make a list of your tasks and prioritize them on a weekly basis. Prioritizing your tasks keeps you organized, holds you accountable and helps you outline the lower-priority items that could be delegated. You’re a practice administrator for a reason, and that reason is because you’re needed to focus on more complex problems. If you’re spending your days working on time-consuming tasks instead of what you’re supposed to be working on, those important administrative tasks will pile up. One thing to keep in mind is that no one else can do those tasks except you. However, you can pass off the lower-priority, time-consuming tasks to other employees. Just because you’re handing off certain tasks doesn’t mean you don’t have to pay attention to them. Follow up with your team to ensure tasks are done efficiently and correctly. There are also going to be times where your practice doesn’t have the right resources to get a task completed and outsourcing may be necessary. For example, if you’re a new practice looking to attract new patients, you may consider hiring some outside marketing help. Outsourcing can be beneficial in a number of ways when you select the right company. Experts will be handling the work, it can be cheaper in the long run, and you get to focus on your work instead. Don’t just pass off the work to the company offering the lowest price. Make sure whatever you’re outsourcing is being done by experts. If it’s not done right the first time, and you have to go back and fix everything, outsourcing is pointless. Your EHR is a powerful tool that can help streamline and optimize your practice. EHRs help practice administrators get tons of work done without outsourcing and without delegating tasks to other employees. With the help of an EHR, a lot of tasks, such as scheduling or billing for example, can be automated and completed more efficiently. What software you use will depend on the needs and workflow of your practice. Software comes in all shapes and sizes. 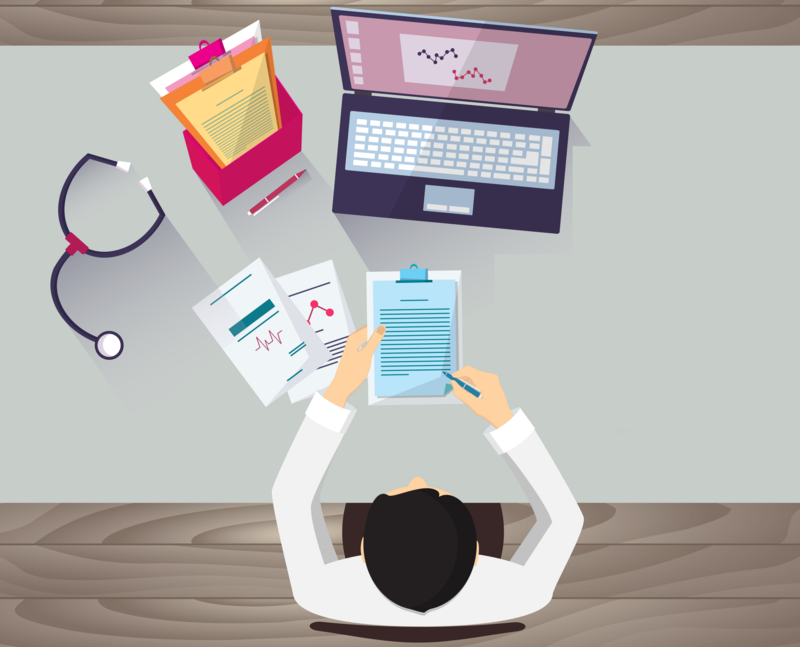 A good EHR will be designed with your practice and specialty in mind. Find a software that provides templates customized to your specialty, features that help you be more efficient and a user-friendly workflow. If you’re an administrator for any medical practice, you know how easy it is to get behind on your work. Regardless of your position and field, we’re all battling with procrastination. We see short task lists or easy tasks and think it’s okay to put them off, but the longer you put them off, the harder it is to catch up. However, as an administrator, the effects of procrastination are a lot less forgiving. The good news is that there are many ways to reduce administrative overload in a practice. The very nature of the job allows you to delegate work to other employees, within reason of course. If you can’t delegate those tasks or automate those tasks in your EHR, outsourcing might be a better solution. But, if you’re able to go into work every day with the mindset that you have to keep yourself busy regardless of how much work you have, you’ll find yourself, and the business as a whole, a lot more productive and a lot less stressful. The best way we find to reduce administrative overload is by hiring a strong team to begin with. These employees are able to multitask, work under stress, and work as a team to get jobs done efficiently and correctly the first time. They will be the foundation to your entire practice. Without them, no one else will have anyone to look to for guidance, which can be the downfall of any practice regardless of how talented the employees are. About the author: Reuben Yonatan is the founder/CEO @ GetVoIP.com—a leading comparison guide that connects companies with a VoIP provider for their needs.